I am a Prize Postdoctoral Fellow at Harvard University and MIT. I obtained my PhD from MIT in 2017, where my advisor was Ramesh Raskar. My research interests are in machine learning, computer vision, and their applications for social good. In the past, I have worked as an intern/visiting research scientist at Google, Microsoft Research, and Samsung Research America. My work has been covered by media outlets including The Atlantic, The Economist, MIT Technology Review, and New York Times. Email: naik@mit.edu Office: 400 Main Street, E19-271, Cambridge MA 02142. In my research, I have developed methods that reduce the need for human expertise and labor in building deep learning systems. Examples include algorithms for neural architecture search and their optimization. I have also developed algorithms that quantify human perception of visual data at scale (e.g., Streetscore) and tools that obtain novel socioeconomic measurements from millions of geospatial images (e.g., Streetchange). Abhimanyu Dubey, Harvard Predoctoral Research Fellow (2015–2017). Now a graduate student at MIT. 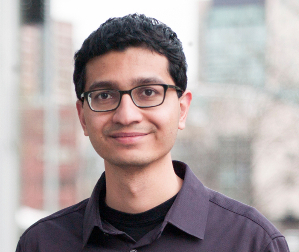 Otkrist Gupta, MIT PhD (2016–Present). Karan Dwivedi, Harvard Predoctoral Research Fellow (2017–Present). These students have been funded through generous grants from the National Science Foundation, Harvard's Star Family Challenge for Promising Scientific Research, Google, and the International Growth Centre. (09/18) Our paper on "Maximum-Entropy Fine Grained Classification" was accepted at NIPS 2018. Preprint coming soon! (07/18) Our paper on Improving Fine-Grained Classification using Pairwise Confusion was accepted at ECCV 2018. (05/18) Streetchange won a Webby Award for Best Use of Machine Learning on the Internet! (01/18) Paper on accelerating neural architecture search accepted at ICLR 2018 Workshops. (12/17) Presenting at NIPS 2017 at the workshops on Meta-Learning and Learning with Limited Labeled Data. (08/17) Streetchange featured on the Harvard Homepage! (07/17) Our paper on Streetchange appears in the Proceedings of the National Academy of Sciences.